Revival is my first and foremost call from the Lord. My ministry is directed primarily toward the church, calling believers to repentance, holiness, and restoration. In all of the messages I preach I give a clear explanation and invitation for people to be saved. However, my philosophy of ministry is very simple… when Christians behave what they profess to believe, evangelism will be a natural by-product. The burning burden on my heart is to see true believers become courageous, contagious, servants for Christ. It’s sad but true, the reason most people will not be saved is because they know someone who claims to be a Christian. Unbelievers can see through the thin veneer of cold empty hypocritical religion. What they need to see is the church obeying the words of our Savior. It’s my personal conviction that preaching the Word of God, through the power of His Holy Spirit, can bring true revival. I believe the Bible is able to accomplish this task because it is inerrant, infallible, and totally inspired by God. Ron is a vocational evangelist who has received a Certificate of Endorsement from the North American Mission Board of the Southern Baptist Convention. He has been traveling in an itinerant ministry for over 30 years. He has preached in 20 different states and traveled to 12 foreign countries. He was elected by his peers as president of the Fellowship of Missouri Baptist Evangelists and served in that position for two terms. 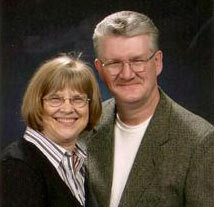 Ron graduated from Moody Bible Institute, Chicago, Illinois, and Bethany Seminary in Dothan, Alabama. Ron and Cheryl Mills have been married 43 years. They live in Blue Springs, a suburb on the east side of Kansas City, MO and are members of First Baptist, Blue Springs. They have one daughter, Tracy Jones. Tracy, her husband Daniel, and their son Graham also live in Blue Springs. We are a non for profit, tax exempt, 501 (c) (3) corporation formed in 1987. Our sole purpose is the proclamation of the message of Jesus Christ, through all available media and means.